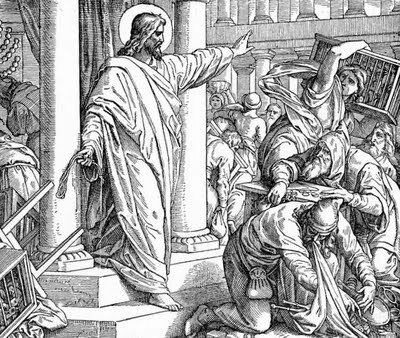 Jesus drives the money changers from the Temple. Image from ETC / University of South Florida. I would say any Christian who leaves the fate of the poor to market forces has renounced Christ in every meaningful sense. Dr. Jim Rigby, an activist for peace and justice and for gay rights and women's reproductive rights, is pastor of St. Andrew’s Presbyterian Church in Austin, Texas. He was interviewed by Alex Doherty of the New Left Project about a radical interpretation of Christianity. Your journey seems to have been one of increasing politicization but without moving away from religion -- can you describe that journey for us? To me, religion is a fancy word for how we build our frame of meaning, and politics is just a fancy word for how we treat each other. As a child I learned an apolitical version of Christianity and was duly offended if a preacher ever brought up social issues in a sermon. Religion, I was taught, was a personal relationship with Jesus. So I could sing “Jesus loves the little children," but did not feel any need to confront the possibility that my nation might be dropping napalm on them. I wasn’t selling out consciously, but it was in my interest not to notice the power systems that left me in a place of privilege. By viewing religion as politically neutral, I could disguise the unfair advantages that came from being a white Christian heterosexual male, My complicity with various oppressions was unconscious, but I knew enough not to explore other ways of thinking, so, on some level, I knew what I was doing. In your sermons, you take biblical stories to have metaphorical but not literal truth. What is a metaphorical approach to reading the bible? If the Bible were literally true we would not need it. We do not need symbols for things on the surface of our experience, but the more deeply we wish to speak of life, the more we need poetry and ritual. Reason does very well at apprehending special affairs like matter, it is not so good at apprehending time. Symbols describe aspects of life that are invisible at any one moment but play out over time. As I studied the stories of the Bible I realized that they were often Jewish versions of much older stories. They weren’t about actual people. They were poems about life as a human experiences it. The figures in the stories weren’t historical but allegorical representations of experiential lessons. Science and history are attempts to describe our experiences from the outside in. Art is the attempt to express those same experiences from the inside out. Religion is that intuitive act that balances those two vital concerns. As the word implies, religion is reconnecting the pieces of our experience into a meaningful whole. We never have enough information, so that effort requires faith. We never can get complete control of events, so it requires hope. We are never completely what we strive to be, so it requires forgiveness and love. You view the gospels as having a radical message -- how is it then that the Church has so often sided with forces of oppression? The church was radical for several centuries but was co-opted by the Roman Empire about the time of Constantine. The reason for this hostile takeover is pretty obvious. It is the same reason corporations buy protest songs and turn them into commercials. Religion deserves much of the blame it receives for historical monstrosities such as the crusades and inquisitions, but more often, religion falls captive to political bullies who use it for very secular purposes. The war in the Middle East isn’t really about religion at all. It is a fight over land hiding behind the cloak of religion. I doubt very seriously that the primary motive for the Crusades was rescuing the holy lands from Islam. I suspect the booty captured by “pious” European kings was much more to the point. The role of religion in violence may be closer to the role alcohol plays in domestic abuse as a “dis-inhibitor." If you blame abuse on the alcohol, you may be missing the real dynamics of bullying. I think Voltaire was right to say those who believe absurdities are much more likely to commit atrocities, but the real question for me, is can there be a religion that honors reason, science, and universal human rights? If we use “religion” as a synonym for supernaturalism, the answer, obviously, is no. But I think it is a conversation worth having. What does the word “God” mean to you? There are many religious forms that do not personify experience using a concept of God at all. Non-theist religion has a rich heritage when it isn’t being burned by theists. So a personal God is not necessary, but it can be a helpful symbol for doing elementary metaphysics -- which is addressing questions like “what’s it all about?” We cannot really answer the question, but our minds will construct some such frame. Einstein would often use the word “God” as a shorthand metaphysical device, probably to save time and give a charm to his imagery. He did not believe in a personal God, but he found the symbol useful for talking about everything at once. Our minds need a frame to begin the task of understanding our experience. The universe is a boundless verb, but our minds need the closure of nouns. Hegel said religion is putting philosophy in pictures. That’s an over simplification, of course, but it states a truth I think. “God” is a human symbol that allows us to speak of everything that is too big, too deep, and too strange for our ordinary understanding. In Hebrew, the divine name of God is YHWH which is a verb form of the word “being.” The other names for God are like facets on that one diamond. The point is not to believe in a being, but to illumine various aspects of being itself. Your Church took the unusual step of accepting a confirmed atheist -- the writer and activist Robert Jensen -- as a member of your congregation. Why did you accept him as a part of your Church? How was his acceptance viewed within and outside St. Andrews? Robert Jensen was an example of someone who had rejected religion for all the right reasons. When I heard his speeches I felt prophetic principles beneath his disdain for religion. He hated religion for the same reason that the prophets hated the religion of their day. When Dr. Jensen joined our church, people inside our church were delighted, but many outside the church were quite upset. It was a bit strange. I received hate mail from theists and he received hate mail from atheists. We were ordered to take him off the roles by the next higher level of the church but we refused. Bob has been a tremendous addition to our church and has allowed people to feel much freer in rejecting supernaturalism and challenging the dominant religion of our nation which is, of course, capitalism. What is your opinion of the so-called "New Atheists" -- in particular Christopher Hitchens, Sam Harris, and Richard Dawkins? When I read an atheist like Bertrand Russell I get a very different feeling. His indignation against religion came straight out of his concern for humankind so he knew where to put the scalpel. I also love Monty Python’s attacks on bad religion. The New Atheists feel more like high school bullies making fun of the slow and weak. I agree with most of what they say, but their cruelty toward their frightened and superstitious brothers and sisters is counterproductive. When confronted with ignorance a fool ridicules and a sage teaches. What is wrong with capitalism from a Christian standpoint? That statement would have been understood as announcing the year of Jubilee, which meant a release of prisoners and a redistribution of the wealth. To pretend Jesus wasn’t political doesn’t make any sense. The Romans wouldn’t have killed him for being a religious leader. Crucifixion was primarily reserved for insurrectionists. The fact that the Romans put “King of the Jews” on his cross was not a religious taunt. It was a threat to any movement of liberation among the people. Much of the religious life consists of ritual. What is the point of religious rituals? What is meant to be achieved by them? I used to hate rituals. I felt manipulated by them. What I have come to realize is, when they are done voluntarily, rituals can be a way our body comes to understand the symbols in our heads. When birds want to mate they don’t say it with words, they dance. It is written in their bodies. When bees want to tell of far away honey they, too, dance. Our bodies respond to certain movements in a powerful way that rational language cannot touch. People often think of religious rituals as acts of socialization, but their more important function is to integrate individuals and communities to the circle of life and to help us move through life passages like puberty, marriage, and death. One of the things that makes Americans so easy to frighten is that we do not have rituals that help our bodies understand that death is a part of life and is not to be avoided. Instead of asking people to live without rituals, I believe we should teach the kind of rituals that would help people to recognize the earth as our home, and every human as a part of our family. Can you recommend some writers on Christianity and religion in general whom you particularly admire. Adult religion shouldn’t in the foreground of our lives. It is more the wonder behind our science, the passion behind our art, and the compassion behind our ethics. I love the writings of MLK, Gandhi, and Tolstoy. But I also love an atheist like Carl Sagan who turns science into a hymn. Richard Dawkins has some nice celebrations of nature. Anyone who tunes their instrument to the chord of nature, and becomes a friend of humankind is singing the one hymn written in every human heart.